Here at last! Cover art and release date for Truth and Consequences! I’m trying to be a decorous and professional author here, but I’m so excited! Just this evening I got the cover art and a release date for Truth and Consequences, book 3 in the Sixth Sense series! OMG, Paul Richmond, the cover artist for the series, has really outdone himself this time–and that’s saying something! This has to be my favorite cover out of the series, and I’ve loved each of them in turn. 🙂 Isn’t it gorgeous? Blurb: When FBI agent Jerry Lee Parker wakes from a coma after a murderous attack on his life, he has no memory of his immediate past. In the blink of an eye, he has gone from having a nearly photographic memory to recalling nothing of the last six months of his life, including his partner and lover, John Flynn. While Lee tries to reboot his past and reconnect with John, there are events at play around him he doesn’t understand. John is keeping secrets from him, secrets which could get them both killed. This entry was posted in Uncategorized and tagged announcements, Dreamspinner Press, male male romance, paranormal, promo, Sarah Madison, The Sixth Sense Series, Truth and Consequences, upcoming release, writing by Sarah Madison. Bookmark the permalink. I am so excited to hear about this book! I love everything you’ve written but this series is my favorite. It’s on my wishlist just waiting for next month (or a sale if they have one before then). You have me sitting here grinning like a loon–thank you! I hope they’ll have a sale too–I’m very excited about this one! Sarah Madison recently posted..Here at last! 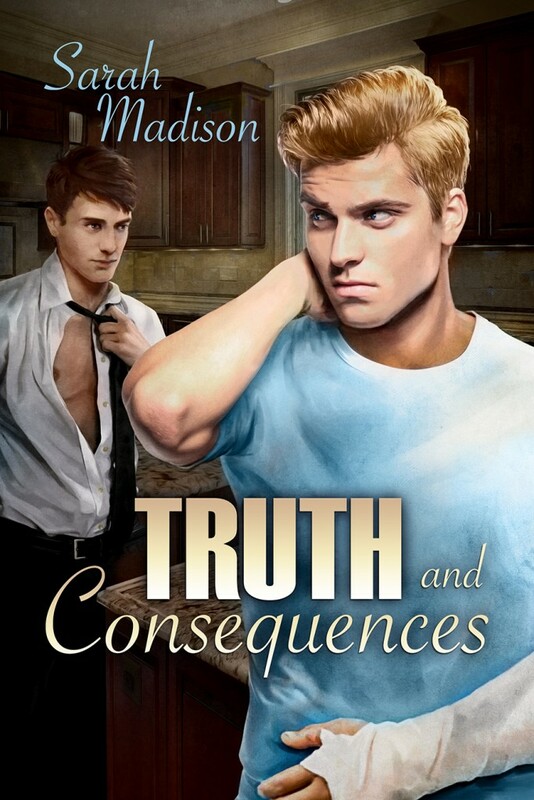 Cover art and release date for Truth and Consequences! Lovely! This is a book to delight your many fans. They’ll love it! Thank you! You really know how to make a girl smile, you know that, right? I’m terribly excited (and a little nervous) about this one–I hope you like it!. I’m so excited for you and for me, too 🙂 Love these guys! *grins* Thank you! I’m terribly excited too! They’re very pretty. Where are they in real life? Yes, we have to have book boyfriends sometimes! Paul Richmond really outdid himself on this one!